This is a great article from The Times Alpha Mummy blog, where I get a great mention. So you've found your way around Twitter and built a nice little army of followers - but how do you know if all of those many, many hours spent online are actually making any difference? How can you be sure that anyone out there is paying any attention to you at all? I'm a bit of a self confirmed stats geek and I like nothing better than spending what little free online time I have trawling through directories of apps that profess to impart the wisdom that I so desperately seek! 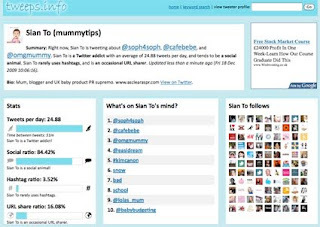 So as a little gift to you all, here are my Top 10 Twitter Monitoring Tools. 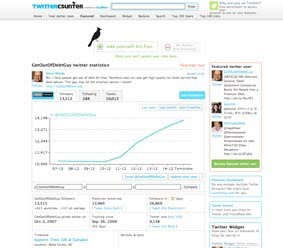 Twittercounter is simply that. It counts your daily Tweets, shows your follow and following numbers and also allows you to track your own account against others. A great way of judging other people's growth as well as projected popularity against your own personal stats. 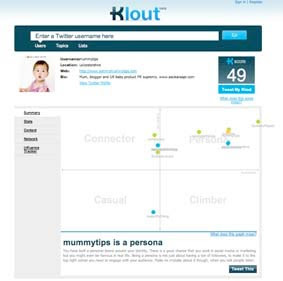 Klout measures influence of social media topics across the world. You can measure people and brands. My current grab is above. I score 49 out of 100 - not great and I am working on it believe me! But that makes my Twitter Persona - an influencer. I like that - so it ranks at my number 2! 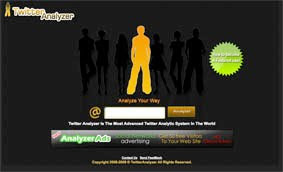 Hailed as being the most advanced Twitter Analyitic system in the world and it certainly does have a lot of info. As with all of these tools I don't think that it 's totally accurate. Take my stats for today for example. It says that none of my messages have been re tweeted - but I have a giveaway on my blog that ends tonight and I have had at least 20 RT's. Still it's a fun way to spend some time. If you're partial to a graph or two then this is the app for you. 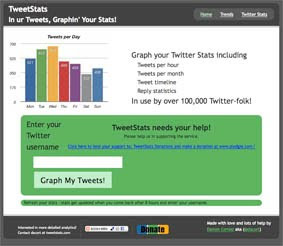 It shows your number of tweets each month, the times of the day when you are most active, the percentage of people that you reply to and who you RT the most. You can also turn all of your tweets into a cloud, here's mine. 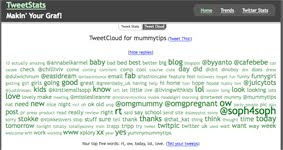 My top 4 most said words are apparently Today, Love, LOL and RT! Another feature packed app with lots of reporting categories. 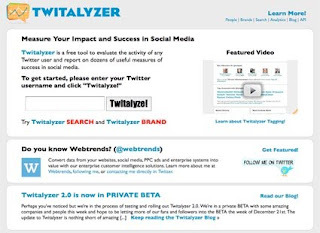 The best thing about Twitalyzer is the advice it gives on how to boost your influence. But downside for me is that it supports bit.ly url shortening and as I tweet from Hootsuite and use ow.ly I'm never going to be able to follow their advice. 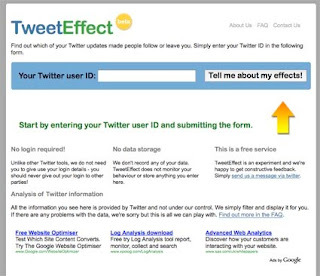 It does have a nifty new feature that allows you to combine your twitter data with your Google Analytics so that you can track exactly which tweeters visits your site. If you want to know who is talking about who and how social and active your fellow tweeters are then this is a good place to start. It's a pretty basic app but no less interesting for it. Now we all like to have a little following cull every now and again and Friend or Follow is a good place to start. It splits all of your followers into three categories, friends (people that you follow who follow you back), fans (people who follow you that you don't follow back) and following (you follow them but they don't follow you). It's a really handy app for keeping on top of your new followers but it can be quite slow to load and it takes you in and out of the main Twitter site to view info on anyone you are interested in - which is quite frankly just annoying. Give it a go - you will be surprised on how many people have ditched you recently! Think your tweets are engaging, funny and interesting? - think again! 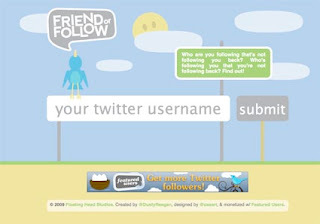 This nifty app tells you exactly which of your tweets gain you followers and which ones loose them. It's really interesting but again I'm not sure how accurate it really is. I get a notice from Twitter every time I get a new follower but I have compared the two and they don't always stack up. Interesting though. 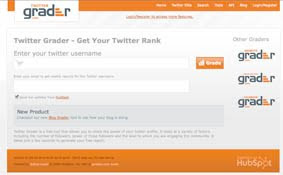 If you're tweeting from a brand point of view Twollow is the best way to keep on top of finding people that mention you. It's not a free service but it's really worthwhile from a time saving point of view. 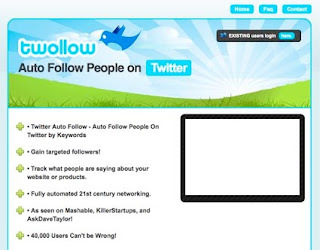 You set your keywords and then Twollow auto follows anyone who mentions your keyword. From my experience I would only use this service for brand names and product names that are unique - or you will just be gaining followers that you neither want or need. 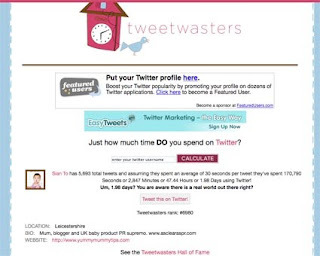 .....And one more for the road - proof as if it was needed that I am addicted to Twitter can be found at Tweet Wasters eeek... have I really spent 1.98 days out of my life on Twitter??? I Have just come across this enquiry from a freelancer writing for Prima Baby magazine. Do contact her if you think that you might be suitable for either story. Would you like to be in Prima Baby magazine taking part in an inspirational and feel good article, and go on a pampering photoshoot in London? If so please read on! 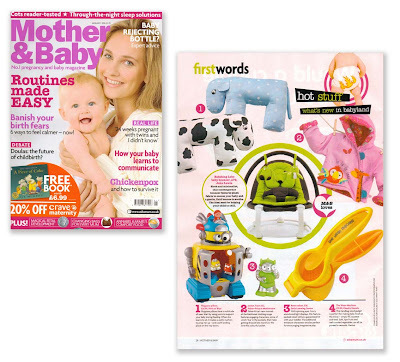 I am looking for mums aged 18 – 42 with child/a child aged 4 or under for two articles. Has a family member, good friend or some other fabulous person (apart from your own mum, or partner) really inspired your parenting style? Perhaps you like how they parent their own children and have taken tips from them? Perhaps they went through a tough time and have taught you a lot about what it takes to be a mum? If you want to pay tribute to your “mentor” then I’d love to hear from you. Please let me know who your chosen person is and why, plus how old you are and your children. I also need a photo from you too. What can I say? Well they have great taste. Thank you Judith & Liat. A big thank you to Cathy at Nursery Online for featuring as Clear as PR's newest addition, The Wean Machine in the news this week. As ever she is a great industry support. Once again it is all go here at as Clear as central! We are saying goodbye to Debra Clare who have been with us for the last year but on the positive side they are being replaced by the totally fabulous The Wean Machine. 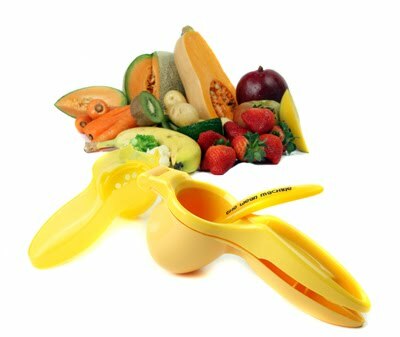 We are so excited to be working with them - their product is nothing short of a revolution for the baby feeding category. They have already bagged themselves a run of awards and are now stocked right across the world. Perfect timing for us to work our PR magic we think! We really should take this opportunity to thank Lynda Harding from easidream for introducing us to Tilly - Harrogate here we come!